At the Top of Squirrel Spur: Things are Brighter! The sun is out, the house is much warmer and things look much more cheerful than yesterday! I spent the entire day on the computer, working on getting a web page set up for a local client. I also dug out the dye pots; I needed some color on a day like yesterday, when the world looked so grim! 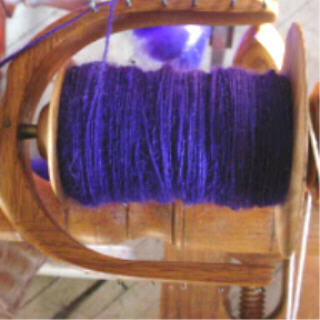 Last night I just had to start spinning the Shetland/mohair roving that I dyed in violet. This stuff spins FAST! Nearly filled a bobbin last night. I'm not used to that; given that I'm usually spinning fine angora singles that take awhile to fill the bobbin. We all went to bed early. It was cold, even in the house, and it was nice to tuck into my warm blankets and flannel sheets upstairs. Lily curled up on her afgan on my bed and didn't move all night, as far as I could tell. But she was up early this morning, with the bright sunshine!